ABC EndoNasal Cranial Correction™ (ECC™) is a very effective method that can help bring the body back into alignment through the correction of cranial bones out of place in a direction the body cannot self-correct. These corrections can result in relief of residual tension around the skull and changes in the entire body. The entire body after treatment can change as part of the compensation patterns change – the effects of the altered mechanical stresses and/or as a result of just plain being pulled or pushed out of place by the forces created due to the misaligned cranial structures. The synchronous mechanical effect of the central nervous system (Spinal Cord/meninges) on the bony spinal column and the remainder of the soft tissues in the body and the head are changed. As key areas of the skull are unlocked, they release built-up stress, which in turn optimizes the body and brings it back into its most natural state. Though one treatment is often all it takes to see immediate pain relief, often so much relief that patients often report cessation of needing pain medication and can live their lives again, it is more usual to need a series of treatments. As the Cranial work continues, the benefits increase and accrue, though the person may or may not need additional cranial treatment. This part of the treatment can, help clients drastically improve their posture and spinal alignment immediately as well as the symmetry of their face. As the body including cheekbones begin to raise, noses can straighten (previously broken, otherwise bent or just naturally crooked – which is usually from physical trauma, birth trauma eg; laying in the womb in a way that deviates the nose), and pinched faces do also become fuller as well as more attractive. This method of bodywork is an incredible advance in physical medicine that constantly amazes people with its powerful improvements to people’s bodies and lives. EndoNasal Cranial Correction by ABC™ is truly a paradigm shift in the physical medicine field. The human body is a single synchronized functioning unit. That means that every part of the body functions in a synchronized fashion. The prefix syn- means together, chrono- means time, so synchronized means working together at the same time. That means all the body parts move together at the same time. As a result you cannot change one thing without changing everything else in the body. • In whatever position you’re in now, without moving anything else, I would like you to turn your head to the left without moving your shoulders or trunk and note how far you turn. Do not do this by feel. Take some other measurement of how far your head turns. After measuring that, bring your head to neutral. • Now do the same thing to the right. Be sure to take some measurement of how far your head turns that is not just by feel. After measuring that, bring your head to neutral. • Without moving anything else, scrunch up your toes tightly. While holding your toes scrunched tightly turn your head to the left and note how far it goes. You will note your head either goes farther or less far than it did previously. Very few of you will note it is the same. • Again without moving anything else, while holding your toes scrunched tightly turn your head to the right and note how far it goes. Again, you will note your head either goes farther or less far than it did previously. Now let your body go back to normal. The point of that little experiment is that even if you’re sitting (so your feet and toes are out of the weight bearing chain), moving your toes will change the motion of your spine and body all the way up to your head and neck. From that you can know that just as with the rest of the body, if your skull bones, the bones of your cranium, are not correctly aligned, it will affect your body all the way down to your toes. Thus the bones of the cranium, just as any other part of your skeleton, need to be in the correct position. That is what Endonasal Cranial Correction by ABC™ accomplishes. The key to accomplishing this cranial bone correction is to find the cranial bones that are out of place in a direction the body cannot self correct because there’s no muscles pulling in the direction needed that are not compensations for something else. Only Advanced BioStructural Correction™ has the methods needed to make the determinations of which bones are out of place in the direction the body cannot self correct that need to be treated that day. That means that you will only correct the things that need to be corrected and not compensations. As a result there are no nasty side effects as are discussed with every other method of cranial treatment that is done using endonasal methods. 1. The balloon sinuplasty procedure takes 2 hours; ABC™ with Endonasal correction takes no longer then 10 minutes on average and is actually more effective because it targets just what needs to be corrected in the skull rather than shotgunning everything and causing nasty side effects by removing needed compensations. Much of the time of balloon sinuplasty is spent creating and thus having to handle those effects during the procedure and does not include the handling of side effects that show up after the anesthesia wears off and the person regains consciousness. 2. Balloon sinuplasty descriptions state that they are “painlessly breaking bones,” which is harmful in the long run and sometimes in the short run as it changes bone structure without correcting the displacements – that lock people into their harmful configuration causing other harmful effects in the head and elsewhere in the body. Breaking bones is generally harmful, not necessary and not a part of ABC™ with or without endonasal correction. Without doing harm, ABC™ widens the breathing passages and makes corrections to much more, including lower parts of the body. For instance, with changes in head shape and correction of meningeal tension below, ABC™ changes the position of the sinuses resulting in better drainage. 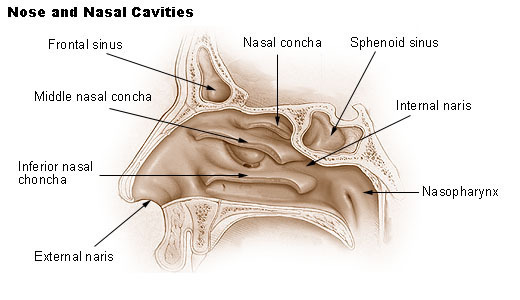 Other methods may claim the sinuses drain better. However, with ABC™, the sinuses drain better and all the structures associated with the throat and lungs and the entire body are corrected resulting in superior flow in all directions in the entire body. This includes ALL fluids, even the digestive system. Another thing included in the above statement is that ABC™ also corrects chest structure which IMMEDIATELY improves breathing capacity (usually by more than 14% on the first visit and more later). ABC™ correction of the chest shape also results in more blood being pumped per beat of the heart (greater heart stroke volume) increasing blood flow throughout the body by a similar amount — most easily seen as an immediate deeper and more even red color in client’s faces. These are not hopeful statements but measured effects that consistently occur. None of these things are discussed in the balloon sinuplasty descriptions because they do not do correction of structure except by accident. Since it is not described as a benefit, you can safely assume they have not seen it in their patients as ABC™ practitioners regularly do. 3. Balloon sinuplasty uses general anesthesia which research shows has significant health risks short term and longer term. Further, the anesthesia is needed for balloon sinuplasty to handle the nasty side effects of changing the positions of bones in compensating positions which should not be changed. With ABC™ Endonasal Cranial Correction, we even treat kids without needing anesthesia. 4. Other methods (including Balloon sinuplasty) do not correct the rest of the body structure and so are extremely limited and short term relief at best and do not have the wide ranging body improvements noted in #2 above. 5. Other methods are significantly more expensive than ABC™ with Endonasal Cranial Correction™. 6. Because of the narrow focus of the therapy in balloon sinuplasty and even other methods of cranial restructuring, they do not get the overall body benefits that correction of the entire body structure creates with Advanced BioStructural Correction™ with Endonasal Cranial Correction™. 7. Because of the entire body structure being corrected, practitioners using Advanced BioStructural Correction™ with Endonasal Cranial Correction™ routinely resolve many conditions that balloon sinuplasty and other forms of cranial change are not even designed to treat. 8. Though balloon sinuplasty is more expensive than our procedure and though it might be covered by health insurance, Advanced BioStructural Correction™ with Endonasal Cranial Correction™ is also covered by health insurance, if the licensure of the health care provider matches with the patient’s insurance.